Passengers were evacuated from a plane at Manchester Airport after a technical problem occurred shortly after taking off in the air. Etihad Airways's EY22 flight to Abu Dhabi left Manchester at 19:28 GMT but looped before returning to the airport 30 minutes later. One passenger claimed that he had a small fire on Facebook behind the plane. The airport confirmed that fire engines had hit the plane, but nobody was injured. A spokeswoman said, "The flight returned to the airport and the fire trucks were in line with the normal procedure." 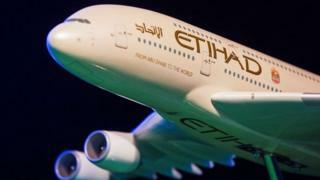 Passenger Graham Ecclestone wrote on Facebook: "Withdrawal Ten minutes later, Notlande lands in Manchester. "Tarpaulin got a small fire on the back, and fire trucks took part in the floor safe." The airline has just confirmed that there was a "technical problem".